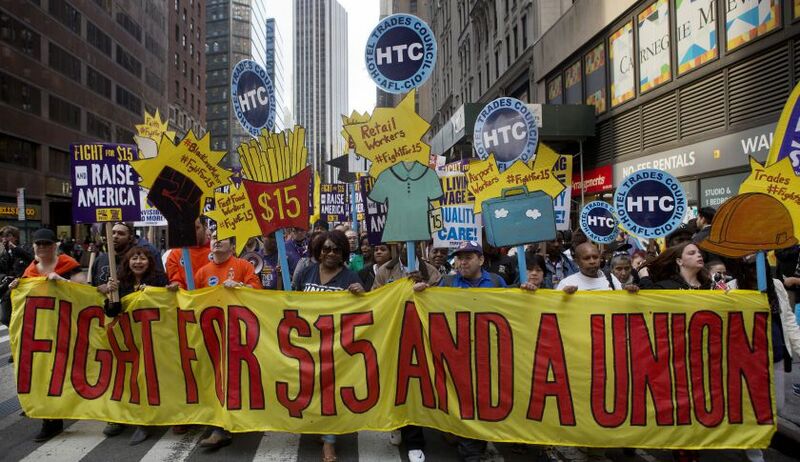 In 2016, at least fourteen states and several cities will implement minimum wage increases. The federal minimum wage will remain at $7.25 per hour (where it has been set since 2009), but states are free to set minimum wages higher than the federal minimum. About 3 million workers are paid minimum wage around the country. Food service workers make up the largest group of minimum-wage earners, according to the Bureau of Labor Statistics. The increases come on the heels of a series of “living wage” protests across the country, including a November campaign in which thousands of protesters in 270 cities marched in support of a $15-an-hour minimum wage and union rights for fast food workers. For more information, check out this great Intelligence Squared debate on the pros and cons of increasing the minimum wage. 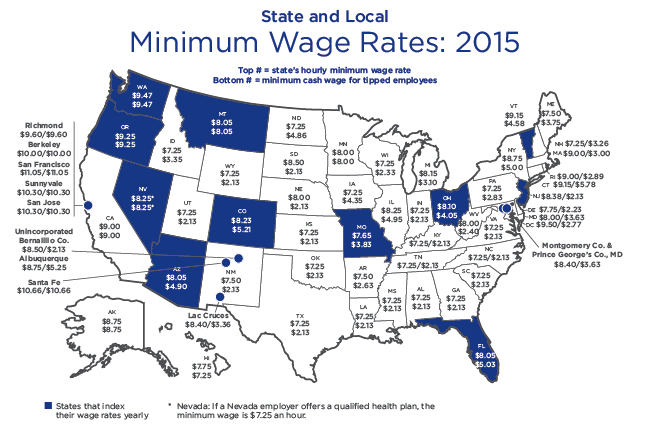 *10 states — Arizona, Colorado, Florida, Missouri, Montana, New Jersey, Ohio, Oregon, South Dakota and Washington — will see small cost-of-living increases in their minimum wages. In Seattle, the minimum wage will rise to between $10.50 and $13, depending on the size of the company, as the city moves toward a $15 minimum wage expected to be fully implemented in 2021. In New York, fast food workers and government employees will see their minimum wage jump to $10.50 in New York City and $9.75 in the rest of the state. Come July 1, the cities of Los Angeles and San Francisco will increase their minimum wages to $10.50 and $13 an hour as they seek to eventually raise the floor on wages to $15 an hour. What do you think? Are higher minimum wages just ushering in an era of robotic fast food workers? 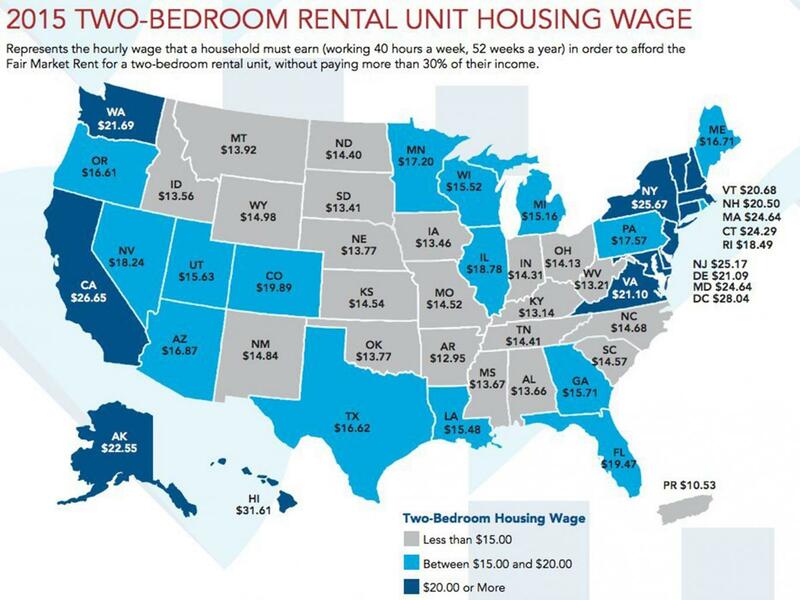 Or is increasing the minimum wage the right thing to do in an era of rising income equality and ever-increasing rents?